Loosely based on Brett Halliday’s Bodies Are Where You Find Them (part of the long-lived series of Michael Shayne novels), the screenplay from Shane Black – previously one of Hollywood’s highest paid screenwriters – deftly unfurls the elaborate story into a fast-paced, engaging yet constantly demanding narrative full of twists and turns. Small time criminal Harry Lockhart (Robert Downey Jr.) finds himself schmoozing with Hollywood clientele after inadvertently stumbling into an audition and wowing casting agents. Teaming up with real-life detective Gay Perry (Val Kilmer) as research for his first role, Harry bumps into former high school sweetheart Harmony Faith Lane (Michelle Monaghan) whose problems, which Harry can’t resist becoming entangled in, land them all in the depths of a shady murder investigation. It’s safe to say that what Black has done is something pretty special, in spite of his sometimes overly complicated style of writing – there’s murders and mobsters and other mysterious mayhem that’s best left unsaid. It’s all integral, though, and never feels like too much – perhaps because Black is a deft hand at fusing many different elements together while still maintaining an air of mystery and tension that permeates the entire film. Not only has he constructed a narrative that forever challenges the audience by throwing shock after shock, surprise after surprise into the fold, but he’s also used techniques such as signalling narration (Downey’s voice was made for it) and wise-cracking humour to mock itself, while acting as a social commentary and subversion to the typical neo-noir crime-thriller films we’ve become all-too familiar with. While Black’s attention-to-detail and accomplished artistry lend more than could ever be said to Kiss Kiss Bang Bang’s resplendency, whoever’s decision it was to cast Downey Jr., Kilmer and Monaghan as the central trio deserves some sort of worldwide honour for their sheer nerve, let alone for the fact it comes together in a way no one could have ever expected. Downey Jr. fits the role of the fast-talking, incompetent and charismatic Harry to near-perfection, adding an usurping energy that sustains the film’s crazy vehemence even when it threatens to lose balance. Kilmer is on fire as the wise-cracking Gay Perry. He and Downey’s on-screen chemistry is fathomless, somehow working an a way that makes you believe they’d stay united for life. Monaghan elevates her role above the usual token female, adding a depth of character to the love interest that’s rarely found in crime-thrillers. Black and the cast’s frenetic nature sometimes threatens to overload proceedings, but there’s so much variety that you simply hit a point where you lose yourself entirely and the films brilliance is able to wash all over you, making you feel ridiculous for ever challenging it. 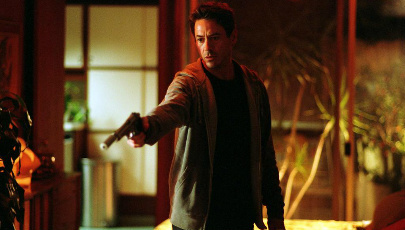 The fact that Kiss Kiss Bang Bang didn’t catch on upon its initial release isn’t something to frown upon, because what’s been left is a seminal masterpiece that should be devoured by all those willing to look past its weirdness and wrap themselves up in its enticing, reckless and joyful silliness.